Check the connected state of the power cable on the backside of the SMART Printer. Check the connected state of the power code, adapter and the electric outlet. Check the adapter connected to the SMART Printer. We recommend you to use our certificated adapter. If you use an non-certificated adapter, the printing or the encoding functions may have some troubles. Check the installed state of ribbon into the ribbon cartridge. Please refer to "SMART Printer User Manual, Ribbon Box and Quick Guide" in the SMART Printer Box for the procedure of ribbon installation. After you install a new ribbon, if the SMART Printer recognizes the new ribbon, the RF Tag on the used ribbon may be broken. In this case, please contact with the local supplier that you bought our products and consumables. ※ You must use the certificated ribbon because the SMART Printer can recognize the certificated ribbon using our Ribbon Tag. If you use another brand ribbon in the SMART Printer, the SMART don't work and it may be the reason of faults. How to load cards on the Hopper? 1. Please open the Input Hopper Cover and load a card or cards on the Input Hopper as the following pictures shown. When you load a card on the Input Hopper, You must not push the card into the SMART Printer inside because it may be the reason of faults. ※ Please refer to "SMART Printer User Manual". Check the connected state of the USB cable to the USB port on the backside of the SMART Printer. Check the connected state of the USB cable to the USB port of your PC. Check the operating state of the SMART Printer driver in the Devices and Printers of the Control Panel. The operating state must be on-line or ready (The icon of the SMART Printer driver must be invoked). Please connect to another USB port in your PC. If this fault continues, please reinstall the SMART Printer driver. ※ If you want to use an external USB HUB for the SMART Printer, you must use an external USB HUB which has a power supplier. The SMART Printer cannot move a card into the printer. Check the card thickness control lever and adjust it to the current card's thickness. Check the contaminated state of the Hopper Roller and clean it. When the Hopper Roller is contaminated, the SMART Printer may be unable to move a card into the printer. ※ We recommend to clean the SMART Printer inside and rollers as below. Please refer to the SMART Printer User Manual. - After the SMART Printer prints 1,000 cards using the YMCKO ribbon. - After the SMART Printer prints 2,500 cards using the KO ribbon. - After the SMART Printer prints 5,000 cards using the MONO ribbon. - After the SMART Printer prints 800 cards using the YMCKOK ribbon. Check the contaminated and installed state of the Cleaning Roller, and fix and clean it. - When you clean the Cleaning Roller, you hold the Cleaning Roller and widen the bracket of the Cleaning Roller and take out the contaminated Cleaning Roller from the SMART Printer. 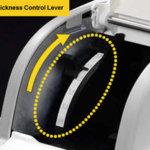 You must clean the contaminated Cleaning Roller with cleaning wipes and reinstall into the printer. 'Ribbon Search Error' is displayed on the LCD panel. Check the ribbon balance using the left LED button on the front panel of the SMART Printer. ※ We supply extra panels on our ribbon to prepare for snapping or skipping. 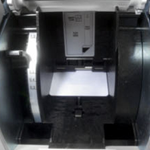 Even if unused panels remain on the ribbon core, when the ribbon balance which is shown by the SMART Printer is '0', you must replace the used ribbon with the new ribbon. Check the installed state of ribbon into the ribbon cartridge. Please refer to SMART Printer User Manual, the Ribbon Box and the Quick Guide in the SMART Printer Box for the procedure of ribbon installation. If the ribbon is snapped, you can connect snapped ribbons together using a stick tape and use the connected ribbon again. Check the contaminated condition of the Color In / Out Sensor because the reason of 'Ribbon Search Error' may be the contamination of the Color In / Out Sensor. If the Color In / Out Sensors are contaminated, you must clean it using soft cloth or an alcoholic cotton swab as the following pictures shown. You can connect snapped ribbons together using a sticky tape and use the connected ribbon again. The reasons of the snapped ribbon are as below. - Check the printing density (Total YMC, Black and Overlay). If the printing density is set very highly, the high heat is applied to the ribbon and it may cut the ribbon. In this case, you must adjust the printing density using the CardPrinterSetup (refer to SMART Printer User Manual). - Check the printing position. If the printing position setting has some problems (the printing start or end position is not correct), it may be the reason of this fault. You must adjust the printing position using the CardPrintingSetup (refer to SMART Printing User Manual). If you use an uncertificated adapter, the SMART Printer move a card correctly but the printing or the encoding functions may have some problems. You must use our certificated adapter. When you print both sides of card, the SMART Printer cannot move cards to the flipper. SMART-51D, 50D & 30D are made by attaching a flipper in SMART Printer, so you have to keep the flipper horizontal with the printer. 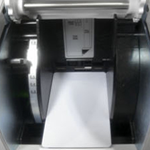 When error is occurred during a card moved to or from a flipper, you can adjust the flipper position automatically using "Auto Rotator Set" in CardPrinterSetup program (refer to the SMART Printer User Manual). After checking the cleaning roller. If the cleaning roller is contaminated too much, please change a disposable cleaning roller. Please check the installation status of ribbon cartridge and whether the print ribbon has wrinkles. Non-standard cards or bad cards. Card thickness control lever is set improperly. Cards have static and moisture. Card Transfer Error occurs when the ribbon is coiled around the transfer roller or the printing roller. Open the top cover and remove the card and the coiled ribbon from SMART printer using front LED buttons. If this problem occurred frequently, check the below things. Non-standard cards or bad cards. Change the cards. You can use only ISO CR-80 card (54mm x 86mm). Wrong printing position setting. Please contact the local supplier. When operating temperature and humidity is out of the acceptable operating limit of the printer. Adjust the operating environment of the printer. An Error occurs while the card is being transferred. First of all, check the Error message at LCD display. Open the top cover and remove the card by LED buttons. If this problem occurs frequently, check the followings. Printer setting is changed or is not proper. Please contact the local supplier. The transfer roller or the printing roller is contaminated with the dust and dirt. Remove the dust and dirt with the cleaning kit as refer to the User manual section 6.1. The card surface is contaminated with the dust and dirt. Check the card surface and remove the dust and dirt and try again. If this problem occurs again, retry with new card. The magnetic head is contaminated with the dust and dirt. The magnetic encoding data is not transmitted or the wrong data is transmitted.Check the setting of the program and the driver and the magnetic encoding data you transmitted. The card is not magnetic card, or inserting direction is wrong. Bad magnetic stripes on the card.